Fuji Single-8 film is polyester-based. 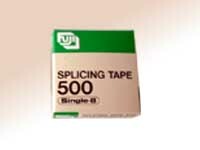 This splicing tape is the only way to splice the film. (100 splices) 8.5mm. x 3m. Limited quantity only 8.5mm. x 15m.